You have a small business and you want to set up an online marketplace to grow your business massively. You have lots of options. Among them, is Magento, one of the best ecommerce platforms built on open source technology and provides online traders with a flexible shopping cart system. You can also create online marketplace with Magento which offers marketing, search engine optimization, and catalog-management tools. Magento 2, the latest version of Magento, is an elite shopping cart that offers the merchants with all the features, functionalities and facilities a company or an entrepreneur needs to run the course of its business into profitability. To create online marketplace with Magento is swift, secure and compatible with varied range of applications, platforms, and devices. However, Magento 2 itself is not able to accomplish your online business goals. When you like to create online marketplace with Magento, you have to meet certain fulfillments to achieve a productive level of activity on your Magento 2 website. To get the most from this feature-rich and powerful ecommerce platform, you must need to install some free or paid plugins or extensions in your shopping website. These plugins will help you expand functionality of your online shops and assure future-proof business with high returns and optimized profits. Here we are discussing about the most popular 5 plugins of 2017 for you. One of the most popular plugins is Apptha’s Magento 2 multi-vendor marketplace platform which is incorporated with some rich features that will help you greatly to create online marketplace with Magento. Its sales increasing features cover everything from setting global commission rates to managing monthly or annual subscriptions. The plugin or extension is designed with two different types of themes with five diverse color alternatives and built with social-media friendly website and widespread control features for admin, vendors, and users respectively. This plugin allows vendors to add 4 different product types. Vnecoms marketplace Magento 2 plugin or extension lets the sellers have a separate panel where they can manage products, sales, orders, invoices, and shipments. As a seller you can customize your storefront within the Magento 2 marketplace and manage your stores from any device with a responsive panel. Being the marketplace owner, you can earn a set fee for each order received by a sellers. This plugin has the option for supporting the largest variety of product types, and the sellers are able to add 6 different kinds of products. Rocket Bazaar Magento 2 marketplace solution is a robust, next-gen, end-to-end, ready-made solution that enables marketplace owners to create their marketplace website. This plugin or solution is designed to facilitate multiple vendors to sell their products on one platform, and customers have the option for buying from different sellers and giving a highly competitive edge to transact with minimal efforts. The marketplace owner earns out of commission, promotions and order fulfillments. Webkul Marketplace Multi Vendor Module converts your online store into the one which can support multiple sellers and provide a different seller portal on the front-end of your site. Here customers can rate and give reviews to different sellers. All the sellers can customize and manage their profile with a shop banner and logo and also can add unlimited products. Sellers can also be able to change the shop URL. Advanced Testimonials Magento 2 plugin or extension lets you have testimonials in your store which is very helpful to convince new visitors to purchase products or services at your store. This plugin provides with a user-friendly experience for each user. Magento 2 extension allows admin to upload images and it is shown in testimonials listing page. Using this features your testimonial page become more trustful to other customers. Enabling reCaptcha on testimonial form. 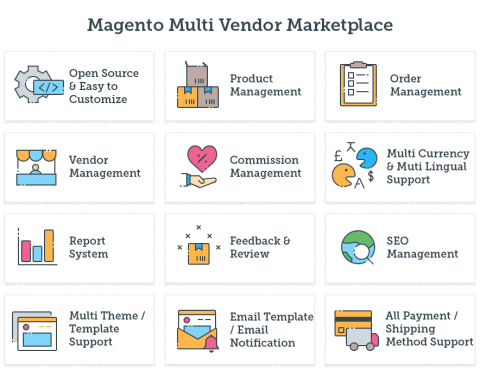 It would be a worthless try to glorify Magento 2 anymore as it’s already one of the most popular ecommerce platforms that merchants around the world use to power their online stores. Nevertheless, if it is a well known e-commerce solution, Magento does not address everyone. Indeed, if you're a beginner with no technical skills, this may not be the ideal solution for you. The question is how much time and what budget do you have to develop your marketplace?